Preliminary voting results posted on county election authority websites indicate that only a few school finance questions fared well on April 2. Unofficial school referendum results from the consolidated election show voters approved six of 20 bond propositions, two of four county sales tax plans, and one of three district tax increase questions per se. A district tax hike was approved in Limestone CHSD 310, Bartonville (a 55-cent increase per $100 of equalized assessed valuation in their education fund). Last year a similar tax referendum in Limestone CHSD 310 was defeated by fewer than 200 votes. A tax increase also was approved through Property Tax Extension Limitation Law (PTELL) ceiling increases in Mokena SD 159. But voters in Collinsville CUSD 10 rejected a tax hike per se, to benefit the transportation fund, a proposed increase of 30 cents per $100 of equalized assessed property valuation. Likewise, voters in Lisle CUSD 202 voted down a $1.9 million proposed tax increase to benefit the education fund. Stockton voters were faced with three referendum questions and four options; they could vote yes on any one of three funding levels or, for the fourth option, vote no on all three funding levels. The board had said that if multiple questions passed, the district would only honor the highest single amount approved. Voter chose the fourth option, rejecting any additional bond funding. Of four countywide sales tax increase proposals earmarked for school facility purposes, voters approved those in Fayette, and Union counties. 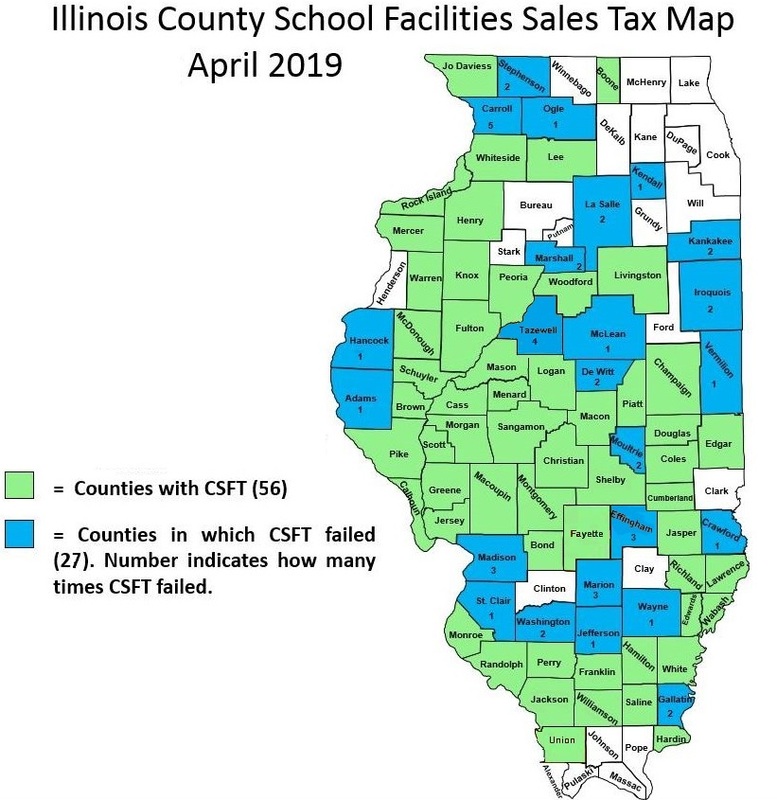 But voters defeated such sales tax plans in Effingham and Tazewell Counties. 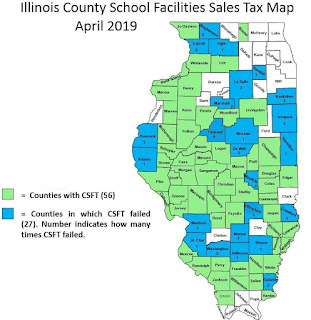 To date 56 counties have adopted a sales tax to benefit school facilities (see map above), meaning well over half (55 percent) of the state’s 102 counties have adopted such a tax.